The Raspberry Pi makes a nice compact platform to attach an indicator light to for all sorts of projects—weather notification, new emails, etc. Read on as we show you how to hook up an LED module to your Pi and set up some basic notifications. Because it’s fun. Unlike many of our tutorials where we include a little blurb at the top outlining exactly what benefit you’ll derive from the project, the blurb is pretty short in this case because the benefit is simply having fun. The Raspberry Pi is a perfect device to play around with, experiment with electronics, and learn some programming. Nobody needs an ambient rain indicator in their kitchen, for example, but building one is a fun exercise and a great reminder to bring your umbrella with you on potentially storm days. To follow along with out tutorial you’ll need a few things. First, we assume that you’ve already followed our previous tutorial: The HTG Guide to Getting Started with Raspberry Pi (and thus have a the basics covered up to installing Rasbian on our Raspberry Pi). If you’re looking to do this project on a budget, we can confidently tell you that the newest model Raspberry Pi is significant overkill for the job and we’d encourage you to blow the dust off an old Raspberry Pi you’ve got shoved in the closet or pick up a cheap used one off eBay or the like. Budget wise the long-in-the-tooth a Raspberry Pi 1 Model A or Model B snagged off eBay for $10-15 is a perfect fit for this project over purchasing a brand new $35 current generation Pi. 1 LedBorg module (~$5.00 with $4 shipping from the UK to US, works with all Raspberry Pi models). 1 Clear Raspberry Pi Case compatible with your particular Pi model like this Raspberry Pi 1 Model B case. Note: The clear/frosted Pi case is entirely optional but if you’re currently using an opaque case then your LED indicator will be hidden inside. You’ll either need to cut a hole in your case to let the light out or use a GPIO extension cable with a breakout kit—like this one from Adafruit Industries—to tether the LedBorg to your Raspberry Pi. While using the breakout cable adds about $8 to the expense of the project it does offer more potential for customizing the end product in that you can more easily place the LED inside things or under something you want to illuminate. While you could certainly build yourself a completely-from-scratch LED indicator (and a search engine inquiry will turn up plenty of people who have done so) the Piborg organization produces such a compact and inexpensive LED module, the LedBorg, that we couldn’t resist using it as the basis for our Raspberry Pi LED indicator project. Installing the module is a snap as it’s designed to fit directly over the GPIO pins on the Pi. First, power down your Pi and open the case. The most important part of the installation process is that you orient the module so that the LedBorg icon is closest to the RCA module on the Raspberry Pi board (and thus the edge of the LedBorg is flush with the edges of the Pi board with the overhanging portion of the LedBorg hanging over the Pi board and not off the edge). See the photograph above. While you have the Pi board open, now would be an excellent time to cover the on-board LED indicators (next to the USB ports), especially if you’re using a clear case. You don’t want it to be confusing to read your LedBorg indicator because the power and network indicator lights are so bright. We covered ours with a layer of white electrical tape. This dimmed them enough so that we could still reference them but they were so much dimmer than the LedBorg it was no longer distracting. Once you have the LedBorg installed and have, optionally, covered the Pi’s LED indicators with electrical tape, it’s time to close the case back up. Boot your Pi up before moving onto the next phase of the tutorial. PiBorg provides a great software package for the LedBorg that includes both a GUI controller as well as drivers to access the LedBorg from the command line. Before we get started you need to make sure you’re grabbing the right package for your version of Rasbian and the revision # of your Raspberry Pi board. Once you have the Revision number and the kernel number, you can visit the Packages section here to grab the link for your package. In our case we’re using a Revision 1 board with the 3.6.11 kernel so we would grab the raspbian-2013-02-09-rev1.zip file. In order to install all the goodies we need to open up the terminal on the Pi. and then input the following commands to install the LedBorg package. Note: You must replace the URL in the third command with the URL of the package for your board/kernel combination. In demo mode you can cycle through all the colors at various speeds, check out the high/low output, and otherwise put the LED module through the paces. It’s here in the Demo Mode section that you can also turn your LedBorg into the first of many indicators. By selecting CPU in the Colours section the LED will begin changing from green to yellow to red to indicate load on the Raspberry Pi’s ARM processor. We suggest changing the Speed to Slow while you’re at it—Fast updates the LED too quickly and makes the CPU indicator distracting instead of useful. The way the LedBorg handles RGB values is that 0 means the channel is off, 1 means the channel is half power, and 2 means the channel is full power. So for example 001 would set the Red channel at 0%, the Green channel at 0% and the Blue channel at 50% power. Change the value to 002 and the LED output remains blue but becomes brighter because the Blue channel is now at 100% output. Change the value to 202 and the Red and Blue at full power combine to make a magenta color. Now that we know how to manipulate the LED manually, let’s look at using scripts to turn our LED from a simple light to an actual indicator. For this portion of the tutorial we’ll be combing several things together in order to turn our LedBorg LED module into a rain indicator based on the weather forecast for our location. We’ll use a Python script to call a weather API which will in turn read the chance of rain for the day, and then toggle the LED from off to bright blue to indicate the forecasted rain. First, we need to get an API access key for Weather Underground. For personal use and small development projects the API is free. Visit the Weather API sign up page here and sign up for an API key. You can generate the forecast for any US city by entering your API key, the two letter state code, and the city name from the URL you pulled from your Weather Underground search results. # The following is a debugging value. # the value in "if pop > 20:" as you wish. Now waiting for a rainy day to properly test the script would be tedious. If there is no chance of rain in your area today and you want to see the LED light up, edit the wunderground.py script and replace the “pop = pop” passthrough value in line 13 with a value greater than 20 such as the 60 that our forecast returned. Just remember to change the line back to “pop = pop” when you’re done. The final step is to set up a cron job to automatically run the script we just saved on a regular interval in order to keep the LED indicator current. Since this task is necessary for both this script and the email indicator that follows, we’re going to cover setting up a cron job after we’ve shown you how to set up the other script. Who doesn’t like the dopamine fix that comes with seeing new email in their inbox? In this portion of the tutorial we are going to show you how to use the LedBorg as an new Gmail indicator. Just like last time, we are going to combine an external input (in this case an Atom feed instead of an API) and a simple script to drive our LED. Once the installation is complete we can set to work creating our Gmail checking script. Again, using Leafpad, paste the following text into the editor. Change the username and password to match the username and password of the Gmail account you wish to check. Just like the rain checking script, we have included a debugging value. If you don’t have any new email you could either send yourself an email to raise your inbox count to 1 or you could edit out the comment hash and change the debugging line to “mail = 1” to test the script. Remember to revert the line when you’re done testing. Hop into the next section of the tutorial to set your Gmail script to run on a schedule. Now that we have two scripts to play with, we need to set up a cron job in order to run them throughout the day to keep the LED indicator current. While you’re still at the command line, you can open up the cron editor. 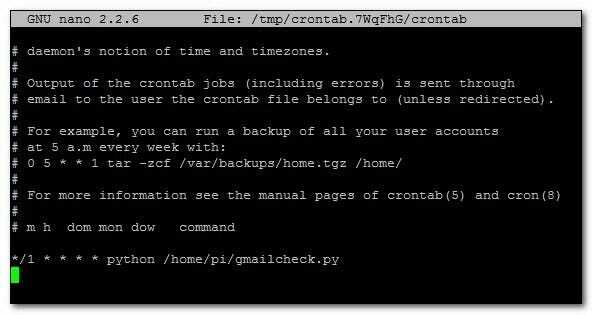 If you have never set up a cron job before, we would strongly suggest checking out our guide to using it here. That said, we’ll walk you through setting up a basic schedule right here. This will open up the Raspbian cron table in the Nano text editor. Use the arrow keys to scroll down to the very bottom. This is where we’re going to setup the recurring cron job for our Python scripts. Press CTRL+X to exit; select yes to save and overwrite the existing cron table. The value we entered in the cron table “*/5 * * * *” sets the script to run every 5 minutes, forever. This entry runs the gmailcheck.py script every minute for a much speedier update notification. That’s all there is to it! You can experiment with your own Python scripts by lifting the if/else statements out of ours and trying them out with brand new variables. If you can find an input source for the data you can turn it into a variable in your Python script—stock market averages, pollen counts, Twitter mentions, if there is an API for it you can turn it into an ambient LED indicator. Finally, I want to give thanks to all the great resources I used to work on this project. It has been a bit over a decade since I was actively writing programs and it took a few knocks to get the dust and rust out. The contributors at /r/LearnPython helped me muck about in the API output for Weather Underground, studying how Michael over at Mitch Tech dealt with the Gmail Atom feed made parsing it for the LedBorg easy, and studying the Python learning modules at Code Academy was a great way to pick up the basic syntax and structure of a language I’d never used before.